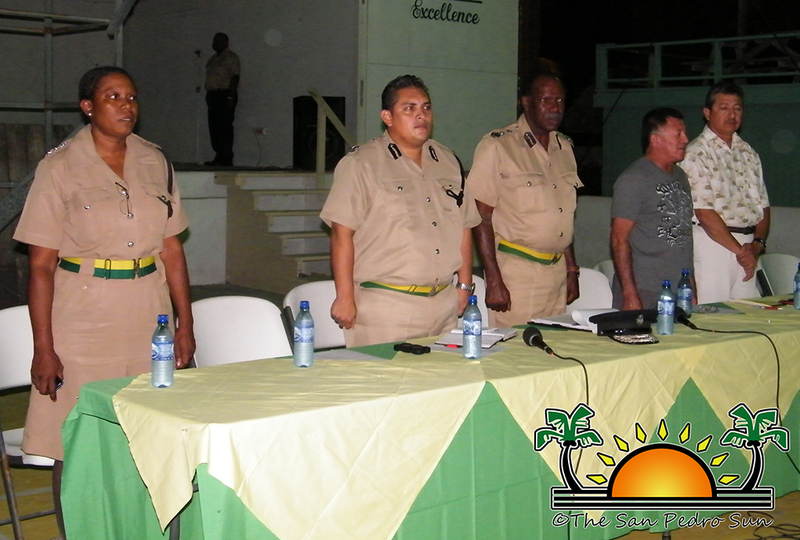 During a well attended town meeting held on Tuesday evening, Oct. 30th at the Rafael Angel Nuñez Auditorium, angry islanders had the opportunity to vent their frustrations about the crime situation on the island. “I have received cancellations from tourists and they are requesting their monies back because of the crime situation on this island… when I lose from this cancellation the tour guides lose, the tour companies lose, the restaurants lose, the community loses and the government loses from taxes,” said an outspoken local business owner Nellie Gomez. The panel consisted of the Officer Commanding San Pedro Police Formation Assistant Superintended of Police Viennie Robinson, Assistant Commissioner of Police and Commander of Eastern Division Police Formation, Elodio Aragon Jr, Commissioner of the Belize Police Department David Henderson, Minister of Tourism and Culture and Area Representative Hon. Manuel Heredia Jr and Mayor of San Pedro Daniel Guerrero. 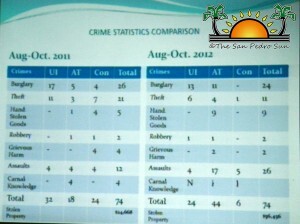 Elito Arceo, a tour operator on Ambergris Caye also explained to the panel that as a direct result of the crime situation on Ambergris Caye, a group of 30 students from a US university have cancelled coming to San Pedro Town. “We need to act now… we need a solution before worse happens,” echoed each resident that went to voice their frustration. 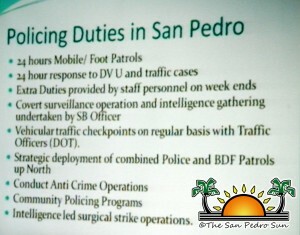 The fact remains that the San Pedro Police Department has a formation of 34 paid officers to service an island 25 miles in length with a population of approximately 25,000. Of the 34 police officers, some work as relief personnel while other work normal hours as regular staff personnel during the day. On any given relief shift (three per day), there are only three police officers. 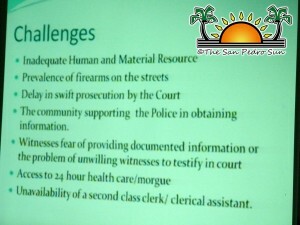 In addition to the excessive workload faced by police officers on the island, they have to live on a very low salary starting at $428 fortnightly upon recruitment. A regular officer gets a salary between $500 to $600 fortnightly depending on qualifications and other merits received while on training. For an officer working on Ambergris Caye, they have to live in the police barracks that have been in a deplorable and dilapidated state for years, having to face water seepage from the floor and roof during the rainy season. 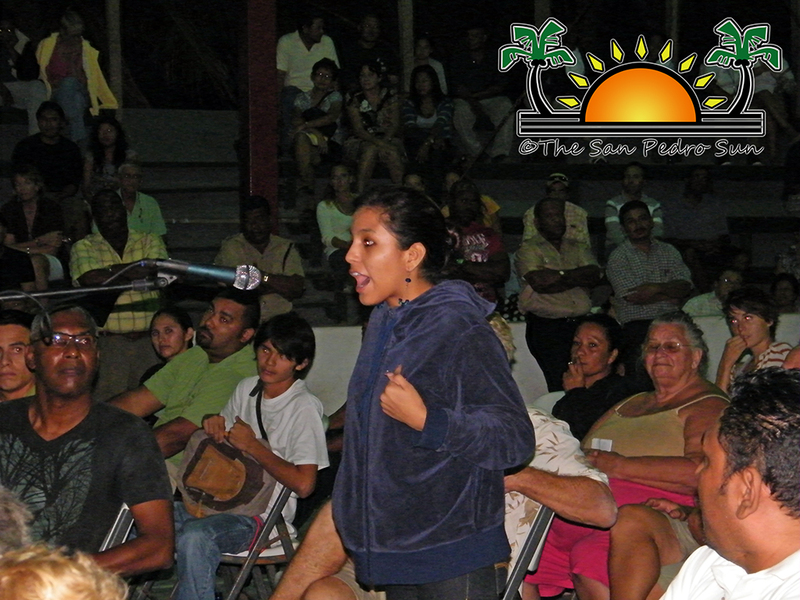 During the public town meeting, in responding to concerns posed by the residents of his constituency, Heredia was not clear in his response and remained silent during most of the meeting. 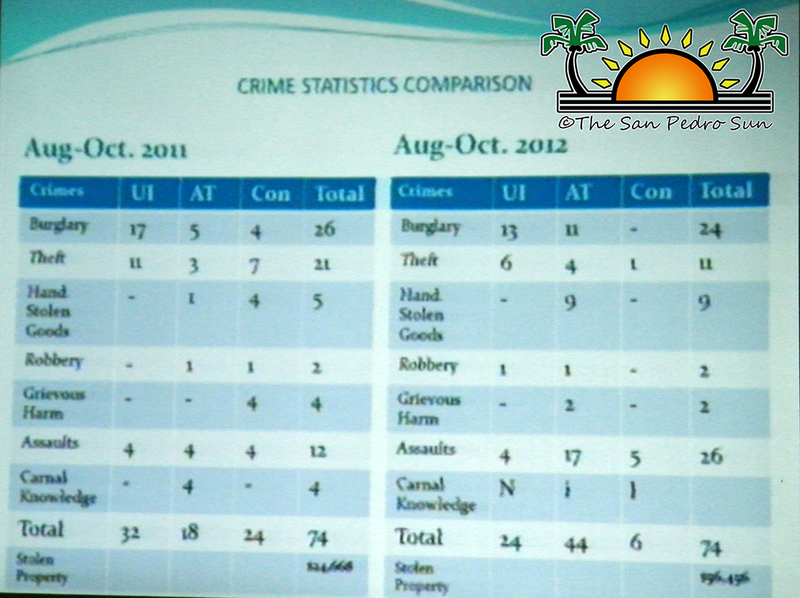 When The San Pedro Sun interviewed Heredia on Friday, October 26th about the crime situation on the island, Heredia was cautious in responding, stating that his “government is on top of things.” According to the Heredia he is working along with the San Pedro Town Council (SPTC) ensuring that from their end, the police department is properly equipped. Heredia Jr. explained that shortly, the SP Police Department will be receiving new handheld radios and they (SPTC) continue to ensure that when a police vehicle is down, that assistance is given to the police in getting soon they will have two of the three police vehicles up and running in a timely manner. “Things cannot happen overnight. We have to come up with a long term plan for the area. Our intention from the Belize Tourism Board is to have a pilot project using a few special constables that would be dealing exclusively with tourists for their protection and safety, with responsibility of patrolling along the beach and Barrier Reef Drive. It is my hope that it will be under the supervision of the local authorities with an experienced supervisor,” said Heredia Jr.
At the meeting Commissioner Henderson said that when the new police officers graduate from the Police Academy, ten police officers will be attached to the San Pedro Police Formation. In addition, he said that the government is finalizing paper work and has indentified a place for a permanent Belize Defense Force camp on northern Ambergris Caye. Two monthly sting operations will be conducted within San Pedro Town in addition to ongoing drug and illegal operation busts on northern Ambergris Caye. As a direct response to the demands made by the islanders at the meeting, effective immediately five new officers will be sent to San Pedro as soon as housing can be identified. 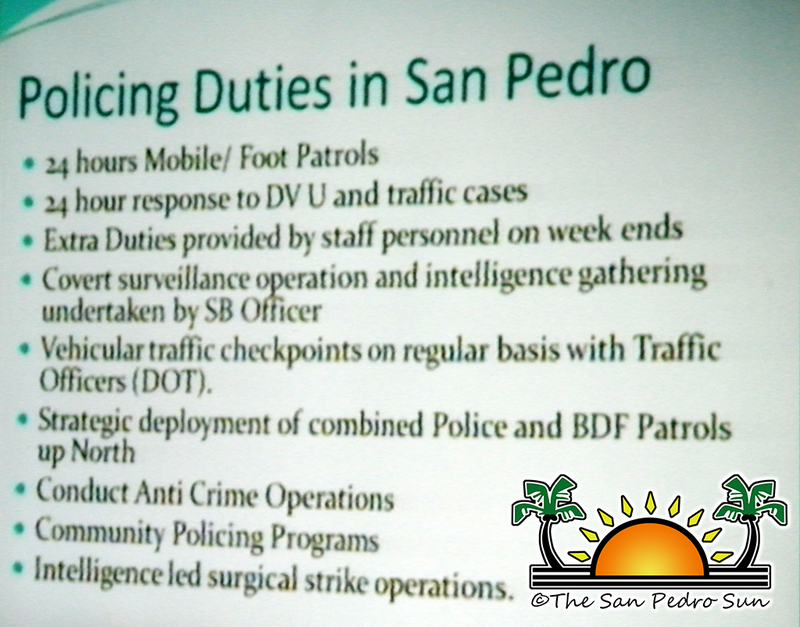 Mayor Guerrero said that he hopes the business community would assist in housing the police for about three months. 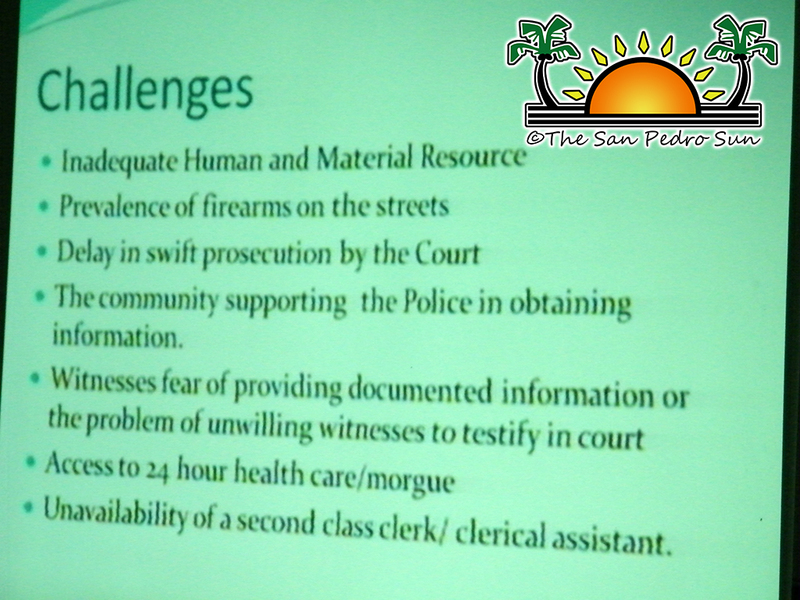 Effective November 1st, a resident magistrate will be sent to San Pedro Town to address the issues as it relates to backlog and pending court cases. With the immediate response by the Belize Police Department working along with SPTC, it is the hope that crime should go down. Commissioner Henderson also challenged the community to get involved in neighborhood watch groups, as well, the special constable program which will help put more “boots on the ground,” and help deter criminals from committing a crime. As it relates to the pilot project indicated by Heredia Jr., the Minister did not indicate when the pilot program would come into effect nor did he indicated what training will be given and the powers that will be bestowed upon them.